Searching for “camera” on the Location Formerly Known as the Android Market (now known as Google Play) yields over 1000 results. 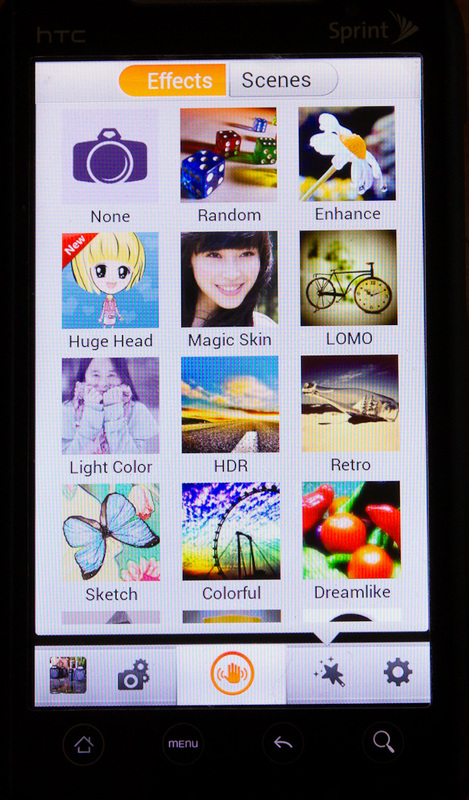 Obviously, not all of them are camera apps but there are still a lot of choices of which one to use. I am going to evaluate five different camera apps I have used. Each has its place, but not all of them are what I normally have on my phone. The camera apps I tested are the stock android app, Camera Zoom FX, Camera 360, Little Photo, and Retro Camera. I tested them on my HTC Evo 4G that is rooted (not recommended since it will void your warranty) and is now running CyanogenMod 7.1. I believe that my results will be similar among different phones though launch times will obviously vary. The camera app that came with your Android phone will also vary but I wanted to use something as a benchmark for my own comparison. The stock camera that came with CyanogenMod is very easy to use and feature rich. Many of the options are available right from the main screen without the need to enter a menu. The buttons on the main screen are easy to understand and I find them comparable to a point and shoot camera. With a single click, it can be switched to video. 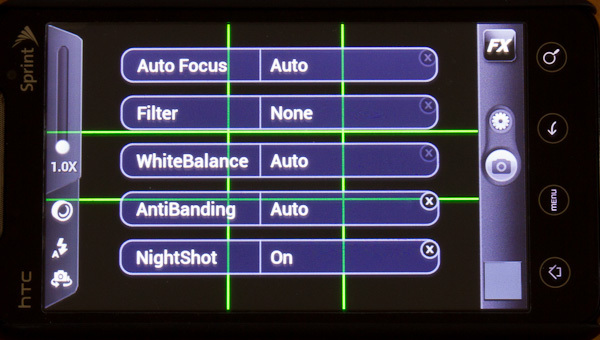 You can also easily adjust the white balance, contrast, saturation, and sharpness. 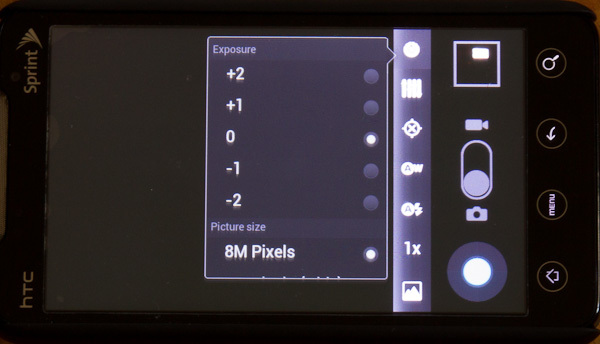 Using the settings button on the screen (not to be confused with the menu button), and there is access to changing the ISO, metering, exposure compensation (+/- 2EV), metering, and much more. There are some extra options available in the menu including adding the ability to use the volume buttons as the shutter release or to zoom. My only real complaint is that the photo preview is only available for about 2 seconds following the shoot. However, it is very easy to access that shot from the main screen. Camera Zoom FX is a fairly powerful camera app. Most major options are available from the main screen, however some things are only available in the main menu. In my opinion, this isn’t a big deal because the options that are buried are things that I don’t change often, such as picture quality. I only have two complaints with Camera Zoom. The first is that the app stays in landscape mode regardless of the orientation of the phone. The second complaint is that the ISO cannot be changed in the app. Like the stock camera app, Camera Zoom FX has many features. It has image stabilization, burst mode, time lapse, voice activation, and collage. When editing, there is also the ability to save both the original and altered photos. If you use Ping.fm, you can log into your account for easy sharing. After taking the photo is where the app really begins to shine. There are ready made filters such as “Dramatic Sky,” “Childhood Once More,” and Holga 35mm. Color adjustments such as “Cinematic” and Lomo can be made along with effects such as tilt-shift and distortion. Camera 360 is another powerful camera app that is like a combination of the stock camera app and Camera Zoom FX. Like the stock app, both the ISO and metering modes are adjustable and like Camera Zoom FX, there are also burst, stabilization, and timer modes. 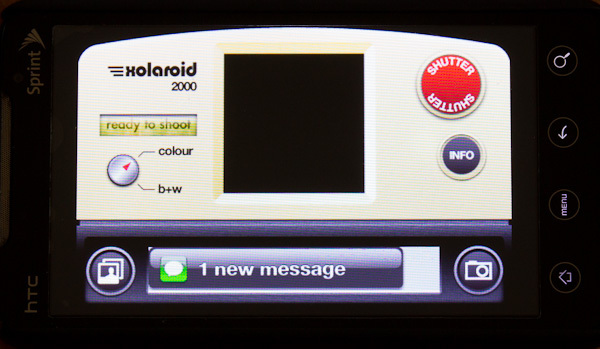 Prior to taking the shot, most major options are available from the main screen. Unfortunately, some other options are hidden in the menu. It is here that you are able to change the ISO and metering modes. The other downside to Camera 360 is that it stays in portrait mode all the time. Like Camera Zoom FX, Camera 360 has different effects that may be chosen either before or after taking a shot. However, choosing before shoot does not change anything until after the shot is taken. It just makes the post-editing a little faster. The nice thing about Camera 360 is that some filters have multiple options within them. 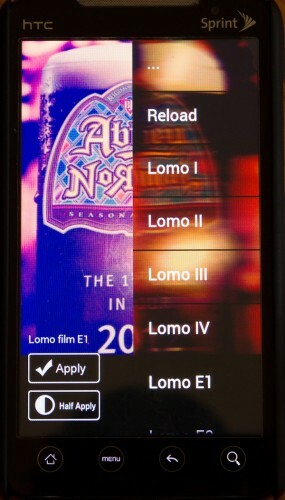 For example, Lomo has the option to choose cyan or autumn (as all as others). Little Photo is probably the easiest to use. When the app is started, you touch the on-screen camera to get ready to take the picture. Once you are ready to take the picture, you can either touch the screen for a 3 second timer or you can use one of the volume keys for an instant shot. It is also from that screen that you can turn the flash on and off. Unfortunately, that is all you can do before you take the photo. Also, the flash seems to default to the off setting and there is no auto-setting. So, if you need the flash then you have to turn it on manually before activating the shutter. There are also only two resolutions to choose from, 800px and 1024px. However, the benefit to Little Photo is that it can be used to edit photos after it has been saved plus it can be used to edit photos that happen to be on your phone (either downloaded or taken by another camera app). It has many options for editing photos. Besides adding various effects such as Lomo or Polaroid (called Instant Film), the app can also add bokeh and text. Retro camera was one of the first camera apps I used besides the one that came with my camera. The app has 6 cameras styles that are based on vintage cameras. Each camera has characteristics such as contrast and saturation that are predetermined and not adjustable. The only real change that can be made to the photo is that some can be changed to black and white. The interface is very straightforward. You choose your “camera” and press the shutter button. Depending on the camera choice, you may also have the option to switch to black and white. Like Camera 360, the ISO as well as all of the other settings are in the main menu. The other problem with this app is that the “viewfinder” is not the whole screen. On my phone, it was about a 1 inch x 1 inch square. Before I talk about which camera apps I use, I want to talk for a moment about the speeds of these apps. For me, one of the biggest things I am interested in when it comes to camera apps on my phone is how quickly can I take a photo. I have an active three year old daughter so speed is important. Depending on your phone, your times will vary but these were the approximate times I got on my phone. 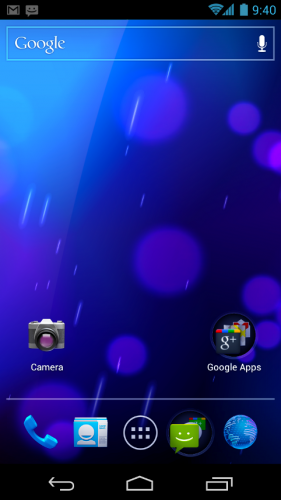 To test the times, I put all of the apps on one of my home screens. I then counted the seconds until the picture was taken. The fastest was the stock camera at 6 seconds. This was closely followed by Camera Zoom FX and Little Photo (assuming the volume button was used to take the photo) at about 7 seconds while Camera 360 took about 9 seconds. Retro Camera also took 9 seconds but it could be more if you need to change the camera type. The nice thing about this review (or maybe it’s a cop-out) is that with the exception of Camera Zoom FX, all of the apps are either free or have free versions. So, try them out and see which ones you like the best. That’s why I haven’t attached any photos I’ve taken with the apps. Still, I want to tell you what I use on my phone on a regular basis (along with a bonus suggestion). After I finished my tests, I removed Little Photo and Retro Camera. I find the lack of options in Little Photo too much of a detriment and Retro Camera is too slow and the viewfinder is too small. I keep Camera 360 on my phone, but I don’t use it very often. If I need a quick or simple shot, I use the stock camera. If I want something more, then I use Camera Zoom FX and at $2.99, I think it’s a great deal (and if you don’t like it, you can return it for a refund within 15 minutes of purchase). Usually if I take a photo, I want to share it right away, on either Twitter, Facebook, or both. The trouble with Android is that to share a photo, you have to pull it up, select “Share” from the menu, and then choose which app to share with. If I want to use just one social network, it’s not hard, but sharing with more than one can become tedious. This is where Lightbox comes in. 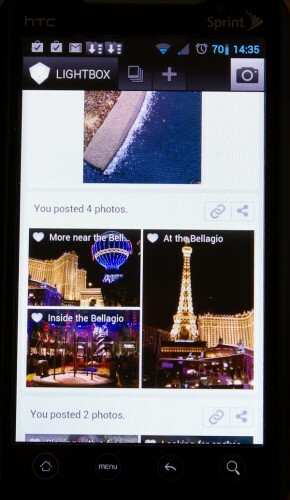 It is an Instagram-like community that also shares easily with Flickr, Facebook, Twitter, Tumblr, and Foursquare. Lightbox has a shortcut that will launch the camera of your choice. I have it paired with Camera Zoom FX. Once the photo is ready, choosing where I want to share it is as simple as clicking a button for each network. Regardless of which camera you use, I highly recommend Lightbox. I actually suggest using Lightbox over Instagram because after playing with Instagram, I found it slow to use without a quick way to take a photo. You can find these Android camera apps on Photography Bay’s Photo App portal. Erik Hawkinson is an amateur photographer with aspirations of going professional. He has been shooting for 2 years and plans to shoot for many more. His photos may be found at www.StellarWindStudios.com.